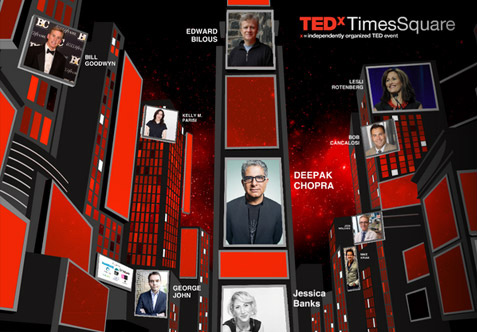 TEDxTimesSquare – A huge success! Pushing Boundaries was a resounding success. Held at NASDAQ Marketsite on May 2, 2014, it explored the edges of convention and the ways in which those edges continue to be shattered by our speakers and the audience of TEDxTimesSquare. They welcomed ten speakers, including the prominent Deepak Chopra. These leaders have created success and made a lasting impact in the professions, business, and the arts. Intelliga was pleased to continue to design the email communications and website, including streaming the live broadcast of the event.